John Kim, 51, a pastor who recently published a photo essay "Pie Making Mom," says for him mother is the word that always gives him heartache. "As long as I can remember, my mother was always standing. Waking up early in the morning, she was standing all day baking pies and cookies at the little pie shop. She also liked working in gardens and cleaning up around the Christian schools she worked at," the Baptist pastor said during an interview with The Korea Times at a cafe in Seoul, last Monday. "The word mother reminds me of the endless scarifies she made over her entire life for the family and others." His new book, comprised of photos of his 80-year-old mother Trudy Kim, whom he calls "the world's greatest pie maker," and accompanying short stories he wrote, is a tribute to his American mother, who moved to Korea in 1959 when the country was still in the wreck and ruins of the Korean War, after her marriage to a Korean man in the U.S. a year earlier. At the time the only western people Koreans had seen in streets were soldiers. The 21-year old bride from Michigan bravely set foot in the foreign country. She has since spent almost 60 years in Korea. "When she arrived at Incheon port on a winter's day, after spending 19 days aboard a cargo vessel loaded with beer for U.S. soldiers, I heard that she was surprised to see a crowd of 30 to 40 people waiting for the newly-wed couple. They were family members, relatives and spectators who wanted to see a rare western bide," he said. "Mother said she was worried during the journey that her mother-in-law might be unhappy about this foreign daughter-in-law. Then she said to me her worries all disappeared when her mother-in-law gave her a warm hug with open arms." Under the life motto of "Bloom where you're planted," Trudy and her husband Kim Jang-hwan founded a small Christian kindergarten and then a Christian elementary school in Suwon, aiming to give equal educational opportunities to children with disabilities. Trudy's pie shop is located within the Central Christian Academy, a private elementary school established in 1994 that gives inclusive education where special needs students spend most of their time with students who do not need special care. His mother sold her handmade pies and cookies, using all the profits earned to spend on the education of disabled students ― 10 percent of the students enrolled at the school. The book shows many photos of Trudy's hands with big joints. "My mother's hands speak of decades of hard work she has done happily. With those hands, she handed customers her warm pies and cookies, making them smile," he said. "They might look ugly to others, but to me they are the most beautiful hands in the world." Now his mother is weak and has been fighting multiple myeloma since 2006. 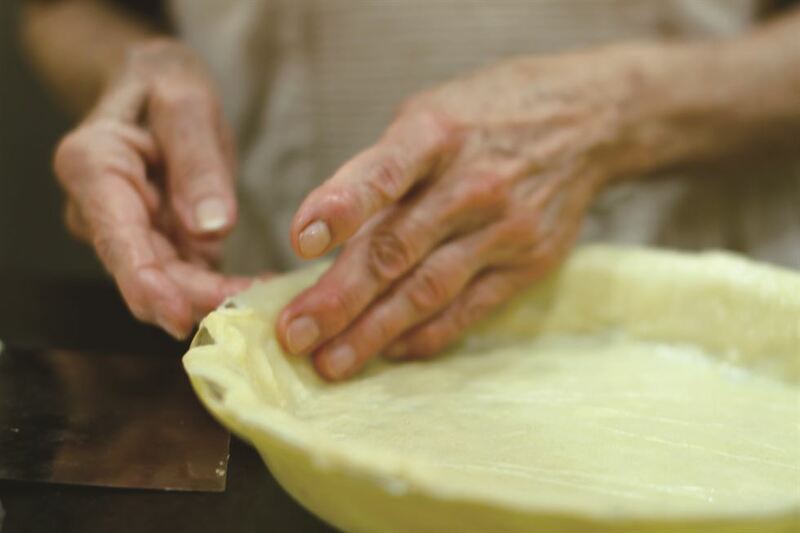 Because of her illness, she isn't baking pies anymore. In the book, John wrote "There is no mother." "What I meant is that a mother is a boundlessly giving person. By giving everything away, she has nothing for herself. A mother is like the air that we cannot see but cannot live without it," he said. "I wrote about my mother's history in the book, but it can also be said to be about all mothers who try to give what little they have to their children." John, the youngest son of Trudy and Kim Jang-hwan, chairman of the missionary radio station Far East Broadcasting Company (FEBC) Korea, says his love for taking on new challenges comes from his mother's side. In the local orthodox Christian churches, where tradition and formality are valued, the pastor has been leading changes to make the church younger and more accessible to both people with faith and those without. Nicknamed a "pastor preaching in jeans," the pastor holds a guitar and gives teachings while singing songs and watching movies. 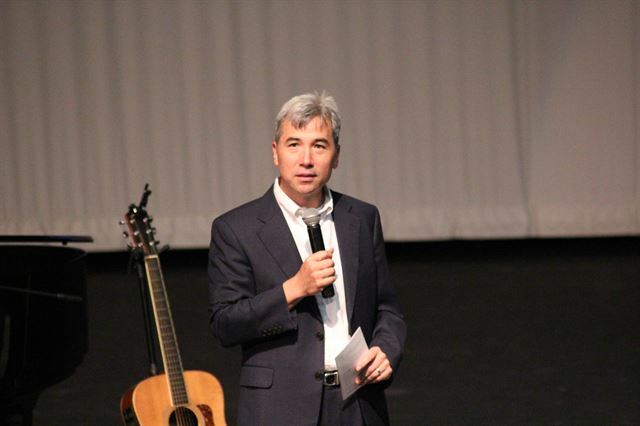 For the denim-clad head of WAFL (awakening flow), a non-profit cultural group founded under the mantra of "Art moves your heart," culture and arts play a big part in spreading the gospel of God through a network of five small churches he has been leading in Daejeon and Seoul. He says his movement was inspired by the seeker-driven churches that he learned about when he was studying in the U.S. "When I was pondering over the paradigm change within the church, I encountered those seeker-driven churches. Those experimental churches used reform to reduce the gap and to provide a bridge between the church and the world," he said. "Although those new concepts were not welcomed in local Christian circles, I think it opens the church door wide to those who are not accustomed to church culture." 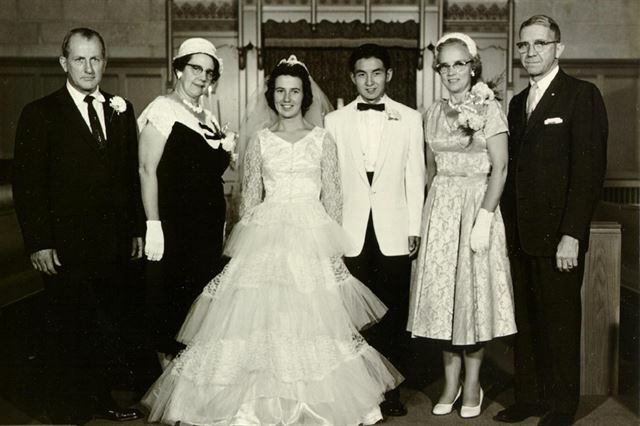 Kim Jang-hwan, chairman of the missionary radio station FEBC Korea, and Trudy Kim at their marriage ceremony on August 8, 1958. The Riverside Community Church he started in Daejeon in 1998 reflects his ideas to bring in fresh changes at a time when the world is fast losing churchgoers. The four-story church looks more like a community center than a place of worship. It's equipped with a gym, spaces for small group activities and a hall for movies. "From its architecture, a church should be built differently. It should be built practically but yet give the cozy and comfy feelings of a little cafe, making anyone who visits the church want to come again and again," the pastor said. He says now more people try to bring changes. As more young pastors learn of other forms of churches, they tend to take experimental approaches. "There is a Chocolate Church that I know. A chocolate maker went to seminary and turns his chocolate shop into a church on Sundays, selling chocolates the rest of the week," said the pastor. "Local churches say they are faced with the biggest crisis of the younger generations leaving them. I think these new forms of churches and fresh approaches could be an answer." Trudy Kim bakes a pie at the Central Christian Academy. More radical is its absence of a giant cross at the Riverside Community Church, in a country where those crosses are almost omnipresent, standing atop church buildings. "Newly established, small churches tend to have no big cross on their buildings because they cannot afford the 50 million won to 100 million won that they cost. Also, those underground churches in North Korea don't have crosses for fear of religious persecution," he says. "Not putting the giant cross up on our church building shows our determination to go back to the humble minds of pastors who newly establish small churches. There is no physical cross in our church, we are trying to communicate the message to people that every one of us when opening our arms can make the symbol of Christianity."